As a contributor to the current issue of The New Quarterly (my short story, "Opening"), I was asked to submit a little write-up for their blog on "Who's Reading What." 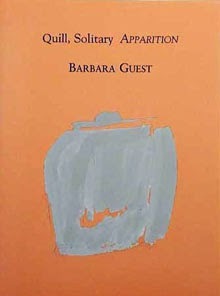 I did a short write-up on Barbara Guest's Quill, Solitary APPARITION (The Post-Apollo Press, 1986). You can read my little write-up (as well as posts by a variety of other contributors to the same issue) here. We recently celebrated the twentieth anniversary of the ottawa small press bookfair, managing yet another successful day of vendors-to-capacity! November also (exhaustingly) included my own participation in Canzine and Meet the Presses’2014 Indie Market (among other events), and I’m hoping to be able to post a short report on at least one of those as well, over the next little bit. 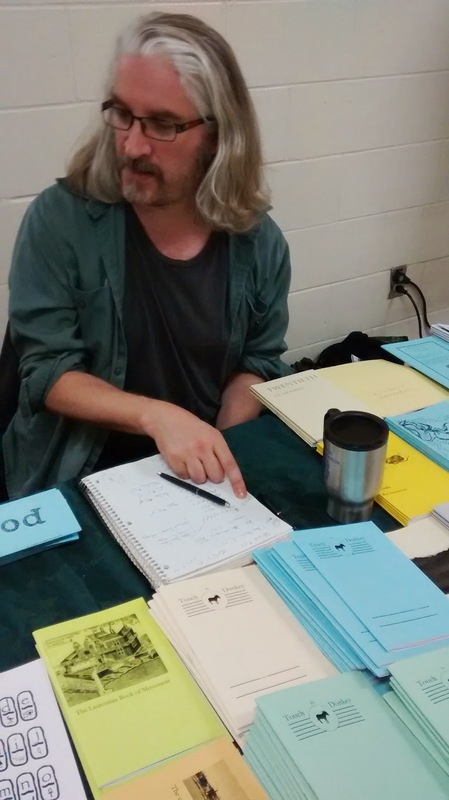 Otherwise, other reports of the ottawa small press book fair include this extensive report (with photos!) by Pearl Pirie, and another by Stuart Ross, as well as a pre-fair report and separate fair report by Brandon Crilly! Ottawa ON: Ottawa poet Marilyn Irwin’s fourth poetry chapbook is tiny (In/Words, 2014), following for when you pick daisies (above/ground press, 2010), flicker (above/ground press, 2012), and the self-published little nothings (2012), with another title to appear with Cameron Anstee’s Apt 9 Press sometime in 2015. What I’ve long admired about Irwin’s poetry is the precision she can capture in such small details, following a trajectory utilized by poets including Anstee, Nelson Ball and Mark Truscott. tiny is constructed out of nine poems, suggesting both a sequence of numbered individual poems as much as sections of a single poem (“tiny”). Toronto ON: Prolific Cobourg, Ontario poet, editor and publisher Stuart Ross’ most recent publication is the chapbook In In My Dream (Toronto ON: BookThug, 2014), available due to Ross’ participation in the pre-fair reading as well as the fair itself, carrying with various Proper Tales Press and Mansfield Press offerings as well as copies of his own works. There is something in this collection of these fourteen short poems that feels slightly different from his multiple earlier works, less a collection built through tone and subject matter than a series of pieces that each move out into slightly different territory, coming together as a kind of collage. After dozens of poetry publications large and small, the poems of In In My Dream give the sense of Ross expanding just what he has been doing with the individual poem now for more than thirty years. After such a publishing history, there are far too many writers who simply end up working the same territories in similar ways, but the subtleties within these works is quite striking. This is Stuart Ross stretching his skills, certainly. It makes me very interested to see how these poems eventually shape into a trade-length collection, and just what he might come up with next. They come right up to the door, but they do not knock and they do not enter. They are sloped such that, if I were a miniature person, I would want to toboggan down them. They are the smooth neck of Kim Novak, of Veronica Lake, of the woman who sells me Time Out at the corner newsstand. They are fuller and fluffier this year, but the lack of sun means they sparkle less. You can push your face into them and leave an imprint of your joy, your anger, your fear. Plus, they accumulate flies surprised by the sudden onslaught of the season, twigs and whirlybirds that have sailed down from nearly naked branches. I peer out my window and see them in the fields across the street, like waves. They gather around bushes and trees, lining up for autographs. Cobourg ON: From Ross’ Proper Tales Press comes Montreal writer Sarah Burgoyne’s second chapbook, HAPPY DOG, SAD DOG (2013), following The Bread Days (Victoria BC: Oak Press, 2011). The title might sound entirely like one Ross himself might have used, but Burgoyne’s prose-poetics take on a shape entirely different. HAPPY DOG, SAD DOG is constructed out of eighteen untitled single-page prose poems, each of which are built as a single paragraph. Hers are an array of sentences that push and prod and extend and challenge, even breathlessly so, such as this sentence, from the second piece: “Since paranoia is conductive to poetics, owing to its derivative hyper-sensitivity, in the hope that such activity and experience of the senses would produce superior metaphors (while at the same time skeptical of this result due to the sound advice of my mother), I set out walking to the end that perhaps a poem would be written during one such peripatetic hypothetical-disaster emergency drill with this (disaster) in mind.” The pieces in this collection open and accumulate in very interesting ways, utilizing structures from the essay, the prose-poem, travel and personal narratives to weave a rather complex tale in a way that feels neither straightforward nor obscure, but entirely clear on its own terms. Given that she supposedly is also the author of a new publication fromBaseline Press, I’m very frustrated to only be just discovering now what so many have most likely known for some time: we should be reading Sarah Burgoyne. One suspects that she is most likely on the cusp of a first trade collection; it is just a matter of time. IN THE EVENT that disaster strikes, if disaster is even what one would call it, and in case all forms of public transport stop, granted that the ground remain intact, then it is good that one would walk, provided that one has two working legs, or even just one, so long as the prosthetic other is sound, unless of course it breaks along the way, given that one does not have a spare, and that the fastening of the spare to the body would be simple enough, on the condition that one does not even need one (or two), and even if one does, well, for the purpose of walking when disaster strikes, one has no other option. 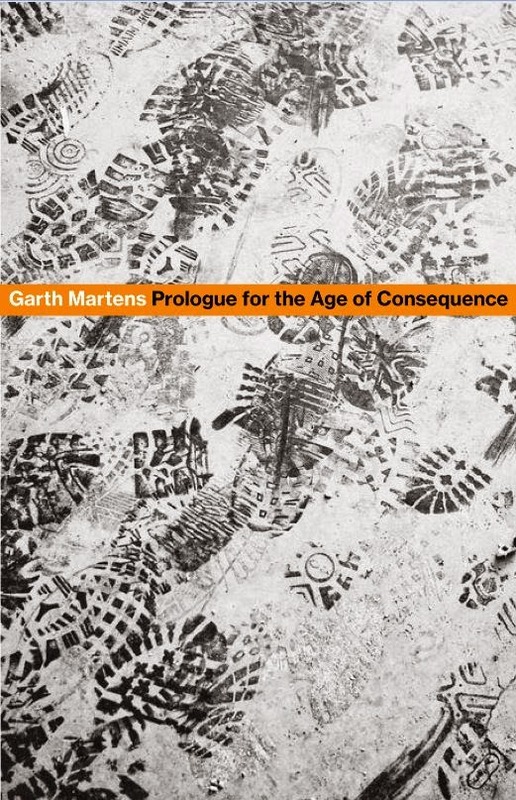 Chris Martin is the author of Becoming Weather (Coffee House, 2011) and American Music (Copper Canyon, 2007), chosen by C. D. Wright for the Hayden Carruth Award. He is also the author of several chapbooks, including enough (Ugly Duckling, 2012), How to Write a Mistake-ist Poem (Brave Men, 2011), and the forthcoming HISTORY (Coffee House, 2014). Recent work can be found now or soon in The Cultural Society, Fence, Paperbag, SPOKE TOO SOON, and The Brooklyn Rail. He is an editor at Futurepoem books and lives in Minneapolis with his wife, the poet Mary Austin Speaker, and their son Atticus. My first book changed my life in the most significant way possible: it catalyzed something that would become love in the poet Mary Austin Speaker, who is now my wife. Any time I’m feeling embarrassed by the effusive earnestness of that book, I look at her and thank my younger self for refusing to edit. My newest book, The Falling Down Dance, will arrive in fall of next year from Coffee House Press, and it’s mainly about the expectancy and experience of fatherhood. So there are different preoccupations, but I actual feel the “voice” of the book is consistent with American Music, so I will undoubtedly look back on this one with embarrassment, too. I think that kind of risk is important. Like in American Music, saying “I don’t want to die / a sad pervert.” People quote that to me all the time. Song has always been the root of my writing. I was a rapper before I was a poet. Most of my first poems were just song lyrics masquerading as verse. Terrible stuff. But now I love flouting the distinction and welcome song into my work over and over. I usually begin with a number of nearly arbitrary constraints and over time most of them fall away like old scaffolding. I am, to my eternal detriment, sniffing out the “book” from the very first line. I think in books. I want poems to engage with one another, to stand as company through shared concern and formal pressure. Often this backfires, stepping all over the poem’s toes where it should be the one leading, but desire for the “book” can be extremely generative. 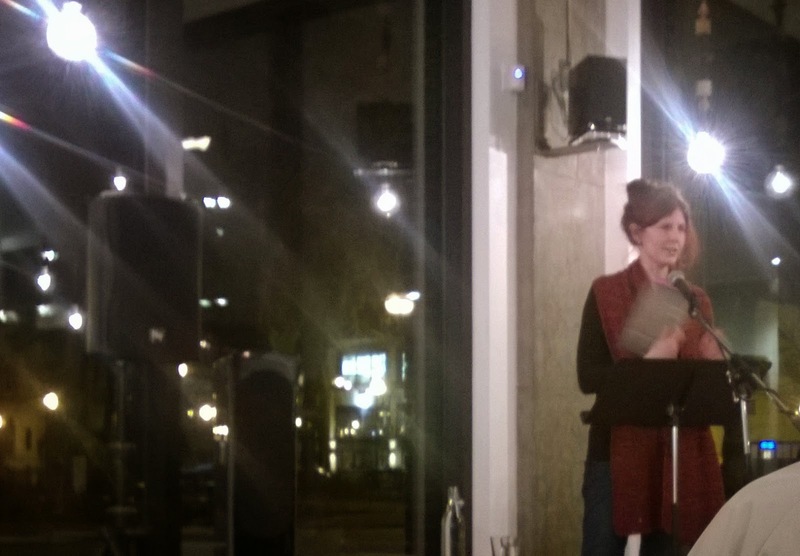 I am the sort of writer who would rather tour the country doing readings than anything else in the world. I’m a Leo. I’ve been known to cajole other poets into performing my choral raps. I hear the poems more than I see them. I went deep with theoretical concerns with my second book, Becoming Weather. There is a central argument against the notion of balance and in favor of what I decided to call disequilibrium. I wanted to offer a disproof of stillness, like Cage with silence. I also didn’t want it to be didactic, so these ideas are more like undercurrents feeding the bloom. The formal structure of the book is supposed to mirror certain ideas about stillness and movement, about the autopsied body of the traditional poem and the dance made possible when it leaves the margin. This is going to sound like the corniest thing ever, but I truly believe it: the poet should be a priest. Or maybe not should, but that’s one role I see for a poet. That’s the path I endeavor to follow. And when I say priest, I’m including warlock priests and demon priests, all the variants. Like the way Rimbaud was a priest. Or how Eileen Myles is a priest. I’m talking spirit, the conspiracy that happens when you get real close to the book and share the poet’s fetid breath. The Aboriginal Australians walked songlines periodically as a means to sing the world back into existence. That’s the poet’s work. I love feedback. I also find it very difficult. And necessary. Go on your nerve: O’Hara. I write in the early mornings, with coffee, before I’ve really woken up. Hypnopompic. I always write out of a practice of reading. During recent impasses, the work of John Coletti, Sommer Browning, Jared Stanley, and always Dana Ward have brought me through. We have a one-year-old son; you don’t want to know. Music, philosophy, film, art, and dance, probably in that order. To give one recent example from each: Angel Olsen, José Ortega y Gasset, Claire Denis, Jenny Holzer, and Steve Paxton. Outside of poetry and the above: David Abram, Rebecca Solnit, John Jeremiah Sullivan, and George Saunders. Collaborate with Chris Martin from Coldplay and Chris Martin from Kid n’ Play. I would like to be a professional shooting coach in the NBA. It seemed like the hardest thing to do. The last great book I read was Jared Stanley’s forthcoming collection, Ears. The last great film I saw was maybe Her? Is that a great film? My critical faculties are so warped by parenthood. I watched a really great documentary on East Bay rap culture called Ghostride the Whip. I’m working on teaching Atticus to be gentle with flowers. I’m also trying to learn more about the Dakota people of Minnesota. And Zebulon Pike. And patience. 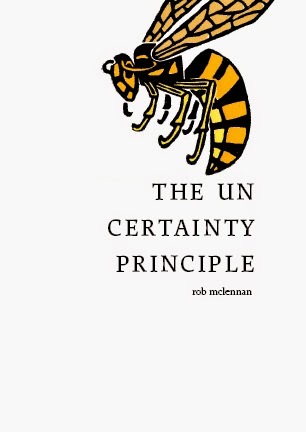 Brian Mihok was good enough to review The Uncertainty Principle: stories, (Chaudiere Books, 2014) over at Rain Taxi Review. Thanks so much! Support The Capilano Review's Kickstarter! 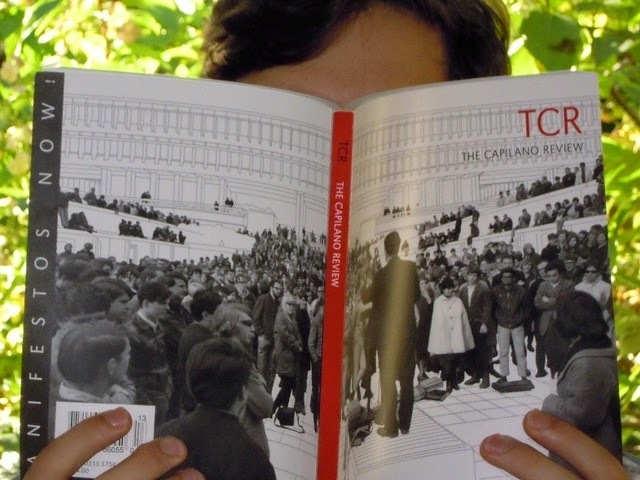 Save The Capilano Review! Check out their clever video for their Kickstarter, and all their magnificent perks! Send something, if you are able. As they write: "The Capilano Review is re-inventing itself as an independent magazine in a Vancouver office. Help us launch our new venture! The Capilano Review is a literary and art magazine that for 43 years has published acclaimed writers and artists, fascinating interviews, pithy essays, and stunning visual sections, along with hosting readings, workshops, writers-in-residence, and more. We’ve done all this while housed at Capilano University, but we are soon to be cut adrift from Cap U—a loss of $85,000 per year to our operating budget. Despite this drastic cut, we are determined to continue! We plan to move into Vancouver as an independent magazine with an unchanged commitment to the avant-garde in the contemporary arts. We need your help launching our new office and our first independent issues!" and don’t forget about the 2015 above/ground press subscriptions; still available! Other forthcoming chapbooks by Gil McElroy, Elizabeth Robinson, ryan fitzpatrick, derek beaulieu and Karen Massey, and watch for a new “poem” broadsheet on the blog soon by Jennifer Kronovet! Eliza Robertson [photo credit: Sara Hembree] was born in Vancouver and grew up on Vancouver Island. Her stories have been shortlisted for the Journey Prize and CBC Short Story Prize. In 2013, she won the Commonwealth Short Story Prize. Her first collection of stories, Wallflowers, came out with Hamish Hamilton Canada and Bloomsbury this year. She lives in England. Well- it made me a "published author" rather than "writing student," but that answer only makes a difference when you've blagued your way onto a work visa. Honestly, I feel the same way about writing as I did a few years ago. My more recent work is less exploratory with form, I think. I am exploring other things instead, like how a character thinks. I have always had trouble with how characters think! Saying that, I just wrote a story modelled after my astrological birth chart. Old habits, &c.
That may be the nature of a class called WRIT 100 at UVic. I studied poetry first term, before I realized eighteen adjectives for "blue" was not poetic. My two favourite genres— fiction and screen-writing— were at the end of the year, after I had unlearned a lot of bad habits. I write so slowly! Novels take ages to start. I have to pretend they are not novels. First drafts do appear close to their final shape, though. That's one bonus to writing at glacial speed. 4 - Where does a short story usually begin for you? Are you an author of short pieces that end up combining into a larger project, or are you working on a "book" from the very beginning? Further to #3, I rarely think of my projects as "books" until I have a book-length word count. Maybe that will change some day. Short stories begin in details or moments for me. The last story I wrote spun out of two gentlemen who suntan in front of the council flats near my house. Sure. I have concerns like insecurities (see above re: "character thought/emotion.") But I don't think that's what you mean. For my PhD, I am researching rhythm in prose...how rhythm can offer an alternative "metaphor set" to analyze style. I am interested in both micro and macro rhythms—from punctuation marks to a novel's white space. I don't dwell on theory when I am writing, though. I am not idealistic or prescriptive about these things. I think writers should be true to what they want to write. The funnelling of that work into "culture" will take care of itself. I have always written with an editor... Be they university instructors, workshop pals, PhD supervisors, my agent, magazine editors, friends or family. Other people's opinions are integral to my revision process. With this book so far, I have mostly worked with my Canadian editor, Nicole Winstanley. I really respect and value her notes. Where I run into trouble, on occasion, is the copy editing. My MA supervisor, Andrew Cowan, once called my punctuation "unhelpfully eccentric." I hear so much good advice and forget it instantly. Right now one the one that applies to me might be, "just get on with it." With porridge and coffee. Typically, I write in the morning for a few hours and do email admin in the afternoon. But that routine has been less defined of late. I write when I can, and particularly near deadlines. Go to India or South Africa. I'd happily work in film. Production or pre-production, probably, though I've enjoyed editing in the past. It started to feel better to do something more creative and self-guided. I wanted to go into law for a long time. Film- I recently watched Nebraska on the plane and really enjoyed it. Well, I am technically still working on that novel I mentioned. And I've started another for the phd. So far, it's set on an island in the 1950s. In his poem “Storm,” Garth Martens writes, “Outside the sun is gone and there is only blackness, a fog of black.” In his debut collection, the Victoria writer attempts through a series of lyric poems to articulate the physical, ethical and human concerns of those who labour in the Alberta oil fields, as well as the implications of the industry for the rest of us. From the poem “Seizures”: “Here, the lineated darkening sand, the cooling rock, / Laura ten paces ahead. Skimming a foot / in the water as the waves tossed, / she said, I’m hanging / by a thread.” This rough and demanding series of incredibly dense and tactile poems, some of which are composed as character studies, and others as extended scenes, accumulate to form a book stretched out over a wide canvas of various perspectives. The Canadian idea of work poetry was loudly championed throughout the 1970s and 80s by poets such as Tom Wayman, Kate Braid and Phil Hall, all of whom still persist in their poetic explorations of that topic, and yet, the conversation around work poetry and work writing has become relatively quiet. That said, this is not the first poetry collection about the Alberta oil fields, after Toronto poet Mathew Henderson’s The Lease (2012) addressed the same phenomenon and was shortlisted for both the Trilliam Book Award for Poetry and the Gerald Lampert Award. In light of these two volumes, it will be interesting to see how conversations around work poetry might re-emerge, and to see just how our understanding of work and poetics has evolved. It is curious that Henderson and Martens use formal poetic language rather than the plainer speech of Wayman and his contemporaries, while still acknowledging the value and grace of physical labour. Unlike a work such as Cecily Nicholson’s 2014 From the Poplars, which turns a highly critical eye to her subject matter, Martens' explorations are more descriptive than critical. Yet his explorations shine an important spotlight on a series of activities rarely discussed in Canadian writing. These are poems very much composed by someone who seems to understand the fields: from what they demand, and just what, in the end, they might cost. Originally appeared in Alberta Views, October 2014. Endi Bogue Hartigan is author of two books of poetry. Her second book, Pool [5 choruses], was selected by Cole Swensen for the 2012 Omnidawn Open Poetry Book Prize and published in April, 2014. Her first book One Sun Storm (Center for Literary Publishing, 2008) was selected by Martha Ronk for the Colorado Prize for Poetry and was a finalist for the Oregon Book Award. She published the chapbook out of the flowering ribs in 2012 in collaboration with artist Linda Hutchins, which includes a long poem and drawings stemming from a joint process-based exhibit, silver and rust. She has new work forthcoming in Denver Quarterly and New American Writing. Her poems and selections have been published in Chicago Review, Verse, VOLT, Pleiades, Omniverse, the Feralist, Free Verse, The Oregonian, Tinfish, Gulf Coast, Colorado Review, Insurance, LVNG, Quarterly West, New Orleans Review, Peep/​​Show: A Taxonomic Exercise in Textual and Visual Seriality, Yew, Northwest Review, Antioch Review, and other magazines as well as the anthologies including Jack London is Dead (Tinfish, 2012), and Salt (Nestucca Spit, 2005). In recent years, she has created collaborative work as a member of 13 Hats, an artist writer collective, and has been a member of the collective which organizes the Spare Room reading series. She co-founded and edited the poetry magazine Spectaculum, publishing long poems, series, and projects best presented at length. She is a graduate of Reed College and the Iowa Writers' Workshop, where she was a Truman Capote Fellow. She has lived primarily on the west coast, and as a child, in Hawaii. She has worked for many years as a communications professional in a public policy environment for Oregon's university system. Her home is in Portland, Oregon with her husband, poet Patrick Playter Hartigan, and their son, Jackson. When I started writing the poems in One Sun Storm this was the first time I felt a body of work growing together instead of singular poems; the poems were echoing and crystallizing and breaking from each other. One Sun Storm’s landscape was largely at the interstice of the personal with natural and cultural perception, and I was working with lyrical/diaristic forms, but also branching out formally. I was wrestling with singularity, its burning point and dissolve, both in language and experience. This book led me into edges and complications of lyric, some of which were realized there, some which came after. Pool [5 choruses] felt like a distinctly different space to write in for, though I think One Sun Storm made more multiplicities here possible. In Pool, I was much more oriented toward the public and political world, though continuing to experiment with a particularly porous, fluctuating lyric. A public sense pressed in on me in ways it had never before, during our post 9/11 years of war, economic troubles, etc. I felt that I was writing within the pressure of public “noise” of elections, war, etc. (important noise in many ways albeit a kind of rhetorical pressure), and thinking about what it is to write in a lyrical mode in this context. The chorus came to me as an entrance; engaging multiple voices and layers felt necessary to me in some way in this highly charged language landscape. It was an entirely new and in many ways troubling experimental space to work in and I had to listen to these poems carefully as I wrote them over time to navigate them forward. I have never seriously tried to write fiction or creative non-fiction—I feel like poetry in itself is such a vast territory to explore and inexhaustible in many ways. I started writing in my undergrad years at Reed College and had long been interested in poetry though had only glimpsed it through the trees. I thought I would study physics, but ended up being far more taken by the humanities than by the science, and drawn to writing. I took some time off before finishing my degree there, moved to California for a while, and really began reading poetry voraciously at this time. Once I started reading poetry seriously it became part of my experience of living. Each of my books took 5-7 years. I write many notes but what I sift out of them is pretty minimal, and these pieces crystallize and are remolded into poems over time. Even if the first lines or notes come relatively fast, which varies, the notes stay with me on my desk for some time and transform, and I experiment formally as I do this, so there are so many stages of reading and writing and different finalities. For a long time in this stage, I wouldn’t even consider it revising so much as listening the piece forward. Once it gets to a certain point of realization as a poem, then I consider it revising. I generally like to live with a poem for a while and keep reading it, and reacting to what I hear, before I know that it is there as a poem. With both of my two books I knew that I was working on book length manuscripts but they were relatively loose groupings, for a long time, with pieces coming in and out of them. In general I see poems growing in something like constellations, occupying a common space and growing in conversation there. Once I see that forming, I can recognize the space I am writing from in a general way, and there are any numbers of particular streams I can step into and expand from, formal directions or subjects that keep the thread moving. I have three such “constellations” on my desk right now. Poems often begin from lines that catch in free writing notes, images or sounds or formal methods that I decide to expand, and see where they turn. My sense of project has certainly changed as my life changes. For example, I started writing the poems in One Sun Storm shortly after the birth of our son, Jackson. I think that the intense presence needs of parenting forced me to find ways to dwell in my work even when I didn’t have time to be at my desk, and as a result I found myself carrying pieces with me and percolating over them for longer periods, which changed the work. Yes, definitely; and though I’m a bit of an introvert, I get a lot from reading and enjoy it. I hear the poems differently when I read them to an audience and this hearing can be teaching at a certain point in the process. I also read them to myself at my desk, with this in mind. With Pool [5 choruses], I had the chance at one point in writing this to participate in a poly-vocal poetry festival organized by Spare Room in Portland, and it was particularly generative for me have friends join me in reading some drafts of the choral poems. Once a poem or book is finished, the reading becomes a way of entering the conversation of the book and finding out a bit about what touches whom, when, where. In terms of what a writer’s role should be in our larger culture, maybe the only “should” is there should not be just one answer. I will say that there is a kind of uncharted hope in writing, to be an original experience, or to sing or speak or otherwise use language in a way it was previously unspoken or unsung. We have so much language and information around us now, but the uses of language often come in decided, pre-packaged, inherited phrases that float in the structures around us –(from useful “please pass the salt” language, to the drum of advertisement slogans, to the stream of data analysis, TV news, spectacle reports, etc.). I think poetry can awaken language in unexpected ways, to pique our sensitivities to how we receive and articulate and move our spirits through this world, a world that holds simultaneously horrors and losses and purple tulips and infant eyes. I’m drawn to poetry’s potential role to navigate modes that cross multiple experiential planes at once— sensory, emotional, cerebral, political spiritual, more, many combinations of which feel uncharted to me. Essential. The editors of both of my books have been very insightful and professional, first Stephanie G’Schwind at the Center for Literary Publishing, and now Rusty Morrison and Ken Keegan at Omnidawn. I admire much work that these presses put into the world so came to both with great respect, but learned even more from the process and the care that I saw go into it. My books were selected through the Colorado Prize then the Omnidawn Open contest, and in both cases there was close collaboration with me in the production of these books, and I was grateful to be able to benefit from my editors’ knowledge. As one example, Rusty was particularly insightful when I faced some line decision challenges with Pool [5 choruses]—I write on a standard 8.5 x 11 page with widely varying line lengths, and this brought up hard decisions about what to do with long lines in the book size page. She had faced this issue with other writers and had wisdom to offer in terms of strategies. Her care in talking with me through those decisions was extremely helpful, and now when I pick the book up, I don’t second guess those line decisions at all. 10 - How easy has it been for you to move between genres (your own poetry to collaboration)? What do you see as the appeal? In the last few years I have collaborated more than I ever have with visual artists and other writers, largely through my participation in a group called 13 Hats here in Portland, and also through conversations with the artist Linda Hutchins whom I initially met through that group. It has not been easy, but it has been engaging and generative for me to do so. 13 Hats was a group of visual artists and writers who worked together on collaborative projects and prompts over the course of two years, culminating in several exhibits and publications. As part of working together, we had regular deadlines for submitting pieces such as at a monthly meeting during which we submitted creations to a “box” project. The biggest challenge for me was letting go of work that felt very much mid-process, letting it enter the collaborative space before it was finished and before I would have been ready, if I was left to my own devices. This challenge was fertile for me in the end—it allowed me to be playful in new ways, and I found that all kinds of cross-pollinations were occurring by the fact of this mid-process exchange. I almost always have extended weekend time to write, thanks to my husband Patrick and son Jackson who support me in this. I usually write on Saturday mornings/early afternoons, and also earl weekday mornings before work as often as my body can handle it. I work a regular 8-5 work week, doing communications and policy work for the state higher education system, so that is the focus during my week days. Evenings are devoted to family and reading. The key thing for me is keeping the thread of my poetry projects in mind. Even if I just have a short writing time for a few days before work, part of my mind will keep percolating on it throughout the week. I bring a notebook with me everywhere and sometimes jot down ideas, lines, to take up later. I make most headway on my writing on the weekends though, when there is space. When my writing gets stalled it’s usually because I’m not giving it enough time, or not doing things that feed my imagination like reading and running and staring at an empty white page. I think even the action of staring at an empty white paper is creative, and I don’t worry about inspiration so much as giving my mind space to work. In terms of reading, when I am feeling stalled, my strategy is to get out of this century, or this country, or both. I sometimes go back to something very old, Sappho or Sophocles, sometimes Blake or Lorca or Dickinson. Sometimes I’ll look for something in translation from another tradition that I haven’t read before (one recent fortunate find here was Valerio Magrelli). In Portland, the smell of rain or drying rain, many variations. As far as my childhood home in Hawaii, sawdust feels sentimental to me. My dad was a carpenter and there was pretty often sawdust somewhere. The natural world is a source of necessary exchange with my imagination. I am not exactly an outdoors adventurer, but I run and walk frequently and I think through my writing during this time. I have certainly been influenced by visual artists in some recent work, but it varies widely by project. I had a very generative conversation/collaboration with artist Linda Hutchins, mentioned earlier, about simultaneity which led us to doing a joint art show together. She drew on the walls of a gallery using all ten fingers simultaneously by drawing with silver thimbles on her fingers, and I wrote and read in the space. This ultimately led to a long poem and collaborative chapbook we produced together, out of the flowering ribs, in which the gestural touch-points of her drawings influenced my thinking about language’s touch-point. This is my most direct involvement with visual art lately. I am also drawn to the artist Betty Merken’s work, whose painting is on the cover of Pool [5 choruses], and am hoping to find an entrance to it engage it in writing. So many different writers have been critically important for me at different times, so I could probably write a very long chronicle, but I will name a few whose work for one reason or another turned me forward in some significant way. Inger Christensen is important to me lately. Reading Alphabet in particular opened up something for me that I have been chewing on for some time, in terms of engaging actualities through lyric variations. My husband Patrick Playter Hartigan’s poetry has been important to me for many years. Here are just some of the poets who have been important to my work at various times from recent to past: Anne Carson, Mei-mei Berssenbrugge, John Taggart, Nathaniel Mackey, Leslie Scalapino, Wislawa Szymborska, Brigit Pegeen Kelly, Jorie Graham, Adrienne Rich, Emily Dickinson, W.C. Williams, Wallace Stevens, Federico García Lorca, William Blake. This inevitably feels incomplete. I’d like to think more about incantation. I’d like to simply experiment with new ways to write. In particular, I’d like to try experimentation with constraints to my process such as writing on particular days or in particular locations, marrying these constraints to the particular subject explored. For example a couple years ago I was writing poems on index cards on buses during my daily commute. This seems to be an interesting challenge/opportunity as my days have become pretty complicated. I would like to let my life be a kind of weather to the poems and see what happens. I would like to think I might have been a physicist after all, but I probably would have been a terrible physicist, and my interest in those edges of knowledge was probably largely an entranceway to poetry for me. Ultimately I would want to focus more on helping people. I’d want to do work that improves the physical and economic conditions and quality of people’s lives, maybe as a doctor or teacher or social worker, so that I could look back on my professional life ultimately and see where my actions touched. I work for the public higher education system right now, where my work supports initiatives for affordability and student success in the public colleges and universities. I am passionate about public education opportunity, so I see such touch-points there, and I feel fortunate to have this in addition to my poetry. Reading… the openings and transformations it offered. My friend Mary Szybist asked me many years ago why do I write, and I remember answering “I write because I can’t.” In some ways that’s still true. I don’t so much mean it disparagingly though there is definitely that; what I meant is that it is inexhaustible, it is a way of exploring and reaching and experimenting and questioning and offering modes of presence to others—there is always the next poem, always something invisible and unrealized and necessary. I loved Gillian Conoley’s Peace— whose work has such enchanting expanse, perceptive specificity and sense of compassion, it kind of turns me inside out. As far as film, I recently watched again, after many years the Japanese film After Life, a 1998 film by Japanese director Hirokazu Koreeda, and I think I will forever recommend this—great film. The movie takes place in the limbo between this world and the afterlife, which is a ramshackle schoolhouse. The premise is that in order to pass on to the afterlife, each individual has to choose a memory to take with them; there are interviewer/film producer (angels?) who interview each passing person and recreate their memories in a low-budget schoolhouse film to take forward. The movie chronicles each individual’s process of choosing a memory. I have three “constellations” of work at my desk that I am working on. One is a manuscript in progress, which I have been working on for several years and it has two different arcs of exploration in it: an exploration of the spectral tug between incantation and report, the draw to describe a world versus the desire to call a world into being; and an exploration of relational spaces i.e. between people, people and animals, people and spiritual states, etc. A second project is a series on clocks and time and kind of intricate domestic mythologies which I am calling “cuckoo clock magic” – this is where I am working most these days. The third project is a series which uses both margins and explores a sense of asymmetry as a lens for seeing.